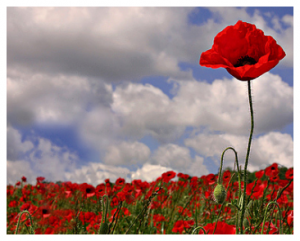 What does it mean to be a Tall Poppy? Being different. In some countries it’s undesirable. I use to work for an Australian company and we’d hear mention of ‘Tall Poppy Syndrome’. Australia has changed greatly over the last decade but Tall Poppy use to be part of the culture. I had to ask when I first heard it too. The term originated with Aristotle, that’s how old it is. The idea is that a uniform field of poppies is ideal and the ones that are taller than the rest should be cut down. The official term is actually intended to be pejorative. 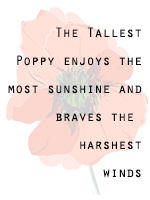 I feel like this Tall Poppy sometimes- at least I hope I am. Is that odd? So how is it relevant in this day and age? I see this in corporate contexts. Say the boss spends $1M on a outside consultant to deliver a finding. The Boss agrees with the finding and cascades it out to the generals and then to the troops. In a corporate culture, the people closest to the the customer, the troops, have no say in the strategy. It would be a rare example to hear about a soldier (keeping with the analogy) who pointed out flaws in the finding and was able to make positive change to the project. Soldiers may be able to affect the implementation, but we do see a higher scrutiny and less tolerance for someone in the ranks to question leadership decisions. The Tall Poppy Syndrome is that feeling that the soldier who makes waves will be scrutinized. That is how it’s been explained to me and how I interpret it. I’ve worked with my share of battle-worn colleagues who have been put in one box on the org chart and then moved to another box the next year then back again. And with the economic downturn these are the lucky ones to have survived numerous waves of lay offs. Perhaps this has something to do with mellowing of emotions in large corporate environments. And it’s the culture of tan cubicles, layers of management, but mostly keeping your eye on the horizon of long term goals. My field of Digital Marketing is constantly reinventing itself and it excites me to no end! So being housed inside of a 40k person company has been such a juxtaposition of large and nimble. Working in the corporate environment has made me a better professional and employee. I don’t want to lose the Tall Poppy in me, that entrepreneur. I’m not going to change the way corporations work but I’ve come to understand the perspective. Corporations are built for long, steady progression. But even though we invest ourselves in our work, sometimes at our own personal expense, corporations manage in thousands not by individuals. The loyalty and passion you invest has to be rewarding to you first. Brave the harsh winds, the sun is worth it. SEO is a very valuable discipline in Internet Marketing, helping customers find your site, and only costs you the resources you put to work on it. Most marketers agree that SEO is a discipline that takes constant attention and staying current with technical issues that change daily. Nope, SEO isn’t getting easier, but at least managing your personal brand online is becoming more accessible to the non-technical. If you’ve ever Googled yourself and seen a mix of your info, other people’s info and really random things, fixing this is now mapped out for you at BrandYourself.com. You don’t have to know much about SEO to improve the ranking of your name in search results- just a lot of clicking, cutting/pasting, and some writing. Marketers know that SEO is worth it’s weight in gold- actually in sweat. The more effort you put into it, the more it will reward you with higher standings in the results and, following that, quality traffic to your pages. The team at BrandYourself.com has created a free, step-by-step process for associating your name with pages that have positive information about you. You help the tool link to the important sites, press releases, accounts you manage- and you tell it which ones are not you (even though you may share the same name). How BrandYourself.com helps is by linking all of your social media accounts and 3 important content links to your BrandYourself.com profile page. Rich with keywords from your Bio, links to your Facebook, Twitter, and LinkedIn profiles, BY is serving up a delicious plate of quality information about you on a search-engine friendly page. Taking it a step further, they walk you through ways to ‘boost’ the ranking of your social media profiles with tips like adding a picture, adding a link, or using your whole name in your profile. If you’re a social media lover and you have digg, delicious, tumblr, blogger, wordpress (etc) accounts, you will be able to connect those as well. It takes anywhere from 2 to 6 weeks for the search engine spiders to come out and crawl your pages again and populate the data into the results pages but BrandYourself.com has a tracking system in place to prove that their tools work. I can’t wait to see what happens with mine!